Matt Demers review Daigo Umehara’s ‘The Willpower to Keep Winning,’ a short book about the gamer’s path to greatness and the value of tenacity. With Evo 2016 over, I took the time to post some thoughts about Twitch’s implementation of its Cheering system for the event, and how it could be improved. Two weeks ago I got some pretty good news; I would be travelling to Los Angeles to do social media for an esports company called Beyond the Summit. BTS does an assortment of Dota and Smash Bros events, and would be hosting a four-day-long coverage hub for the upcoming Manila Major Qualifiers. For the last little while I’ve had an idea to do a tea-based streaming Twitch as part of their Creative hub. I pulled the trigger on it this past Thursday with the first episode of Tea on Twitch, which I think went really well. Apparently the 2015-16 Golden State Warriors have had a pretty good NBA regular season. If they were an esports team, would they be able to continue that? This is a bundle of over 125 RSS feeds that can be imported into major RSS readers (Feedly, TheOldReader, InoReader) in order to read content directly and totally. League of Legends and Dota 2 are two of the hottest online games right now. Learn what makes the companies behind them tick when it comes to dealing with their communities. Nintendo has released their first-ever social media app; how does it stack up against all the others vying for your time? Heading to a live event in the next little while as media? Here’s some tips to get the most out of your preparation. Pitching is one of the most important parts of a freelancer’s toolbox. 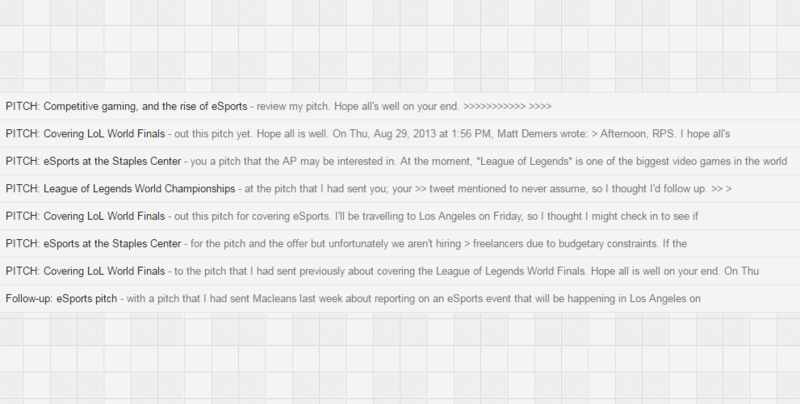 In this post, I look at how to pitch an esports or gaming publication, and the sections that make up a successful pitch.